Too Cool Chix all natural ice cream sandwiches are layered with handmade, soft cookies, paired with extraordinary micro-batch ice cream, what we call our “magic in the middle”. Our sammies are beautiful and have delicious classic and innovative flavor combinations. 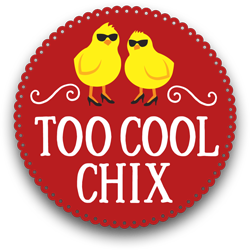 Too Cool Chix, a women owned and operated business, is located in New York City. We patronize local farms and dairies. We support international and local non-profits that focus on bettering the lives of children. Our business is almost as cool as our ice cream!